This episode is a cooking episode as part of the Canadian Food Experience Project. 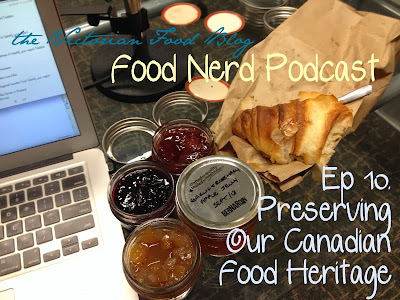 Head on over to acanadianfoodie.com to find out what other food bloggers from across Canada had to say about preserving our Canadian food heritage! For this episode my fellow Victoria-based blogger Amy Bronee from familyfeedbag.com teamed up with me to jointly tackle this months challenge. Amy is an amazing recipe blogger who teachers canning classes here in Victoria, so I was extremely thankful for her for sharing her wisdom as I knew nothing about canning! This episode got Pretty Food Nerdy: Amy talked about what you need to get start canning, the best times of year for different kind of preserving, gave an explanation of what 'safe' canning means, let me try some of her magical preserves, how to become a Master Preserver & she even demystified pectin...!